The latest BimCOM version is ? 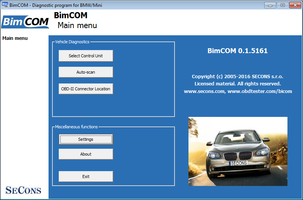 BimCOM is diagnostic tool for BMW/Mini vehicles. It supports all vehicles since 1996 using OBD2 or BMW-20 pin diagnostic socket. BMW Motorrad (motorcycles) support is in very early stages (please see BMW Motorrad coverage). BimCOM is easy to use. It uses VAG-COM-like user interface, but easy to use for people familiar with dealer tools such as BMW ISTA/D, ISTA/P, BMW DIS/GT1. 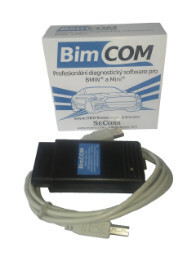 BimCOM comes with OBD2 to USB interface and is designed to work on Windows 2000/XP/Vista/7/8/10 or Linux or Mac OS/X (using Wine emulation). Hardware requirements are very low compared to dealer-tools. Our OBD2 to USB BimCOM interface contains 2 multiplexed ISO9141 K-Lines and L-Line, high-speed CAN-BUS and analog measurement circuits. Supported protocols include K1, KW-71, DS-1, DS-2, KWP2000* (KWP2000-star), KWP2000, BMW-Fast, D-CAN/KWP and UDS ISO14229. Please use our contact form if you wish to get more information about BimCOM. If you are car owner and decide to purchase the BimCOM, we'd be very happy if you can provide data from your car to help us further improve BimCOM. We're open also to any improvements recommendations or feedback. You'll get: BimCOM OBD2 USB interface, USB cable, quickstart sheet. All this packed in a box. Software download online (software on CD-ROM on request only, the software outdates very quickly, so please consider if you really need installation media). Everything is packed in bubble-mailer and all shipment are 100% insured. For more information see global product order page. We provide standard 2-year warranty for our products. Optional carrying case is available. In addition to documentation below you migh find useful also DiagWiki.com tutorials related to BimCOM.